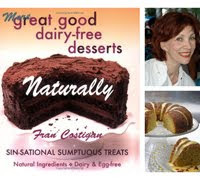 Vegan Dessert Diva: Have you met Fran Costigan? Fran Costigan is a vegan baking diva, for sure. Fran has baked, frosted, sliced, whipped and swirled up more than a handful of vegan treats in her day. "I Teach, but don't Preach," says Fran. Every at-home dessert-baking-diva (vegan or not) needs to know Fran. "Experience, creativity, zest for her craft and good old fashioned charm ooze from this awesome vegan baking diva." ~Moi, Kathy. 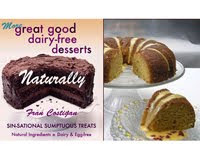 My Review of Fran's Book: More Great Good Dairy Free Desserts Naturally. I love Fran's new dessert recipe book. Not only is it filled with a diverse collection of decadent vegan desserts, but it is a golden resource filled with vegan baking tips, tricks and lessons. I love how Fran includes a few basic concepts like: "Cooking with Tofu" and "Cooking with Starch". Plus, the "essential ingredients" resource is a priceless tool for any new or experienced vegan cook. I ask you this, do you really know what Agar (or Agar Agar) is, and how to use it in vegan treats? With this book you will! Fran chats about basic and advanced concepts of vegan baking. Topics like "how to choose, wash and store blueberries" and "how to roll out Foolproof Flaky Pie Dough" are covered. And with so many recipes, there is something for everyone. So if you can't make it to NYC to participate in one of Fran's amazing vegan cooking classes - simply grab her new book and dive into her wealth of vegan dessert knowledge. Fran will help you master the art of vegan treats, all while having fun and embracing your own creativity in the kitchen. "Fran Costigan is a nationally recognized culinary instructor, author, consultant, recipe developer and innovative pastry chef who marries healthy eating with sumptuous tastes. A graduate of the New York Restaurant School and the Natural Gourmet Institute, Fran was a pastry chef in both traditional and vegan kitchens. Today Fran teaches her distinctive courses (including her Vegan Baking Boot Camp) in NYC at the Institute of Culinary Education and at the Natural Gourmet Institute, and she presents demonstration classes and lectures at venues throughout the US and Canada." 1. Place the chocolate in a medium heatproof bowl. 2. Pour the creamer into a small saucepan and bring to a boil over medium heat. Pour over the chocolate and let sit for 1 minute. Stir gently with a rubber spatula until the chocolate melts and is smooth. 3. Pour the ganache into a shallow dish and refrigerate for 1 to 2 hours, or until firm enough to spread. The ganache will keep for one week in the refrigerator. Warm to spreading consistency in a heatproof bowl over simmering water, stirring until it can be spread. Excerpt from Book: This colossal cake elicits oohs and ahs when set out for serving, but the proof is in the tasting and this cake goes to the head of its class. A Bundt pan is a deep pan with a hollow center core, similar to an angel food cake pan, but with fluted sides. The hollow center is necessary to ensure that the large amount of batter bakes through. 1. Position a rack in the middle of the oven and preheat to 350 degrees. Oil a 10- to 12-cup Bundt pan thoroughly. 6. Remove the cake from the oven and cool in the pan on a rack for 15 minutes. Place another wire rack on top of the cake and turn the pan upside down. Shake the pan gently to release the cake. Cool the cake completely before serving.